This post was sponsored by Tiny Universe. This product review of Around the Crib infant clothes is the most adorable thing we’ve seen today. As if parenting isn’t hard enough, finding cute clothes that can withstand the curiosity of your children is near impossible. 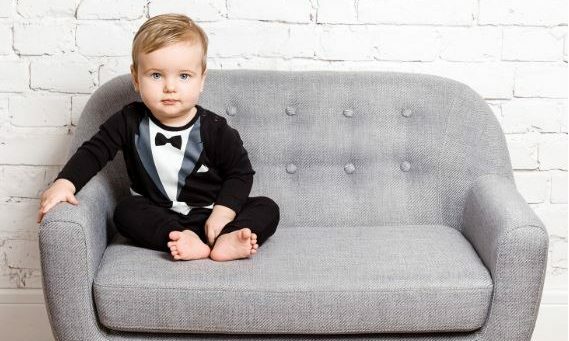 Every parent wants their children to look just as glamorous as a celebrity baby, and these designs will help you do just that! Product review: baby clothes to help you parent in style! Around the Crib, a division of Tiny Universe, is couture fashion for your beloved little one. Tiny Universe started as a family business 55 years ago and has since become the leading company in headwear. Since then, they have branched into subsidiaries, such as Around the Crib, designed and tested by parents, to create everything you could need for ultimate parenting. Colored in soft pink or black and white, this layered, short-sleeved dress can be as delicate or as modern as you choose. Sizes range from newborn to that of a six year old, so siblings can match! The zipper in the back allows for easy dressing on those frustrating mornings. The dress is machine washable and certified by Oeko-Tex, indicating a lack of harmful substances. Priced at $77, it’s the perfect dress for a special occasion. This tiny dancer outfit will help those wiggly little legs look even cuter! Sized from newborn to 24 month olds, the ballerina dress is great for hyper toddlers. The ballerina skirt is made from tulle, while the body is 100% cotton. Another machine washable dress means an instant addition to your toddler’s wardrobe. At $43, it’s a affordable way to show off your energetic baby! What better way to end a product review for your kiddos than with a night light? It will help end your day in the most peaceful way. This rabbit-shaped light is as unique as it is delightful. 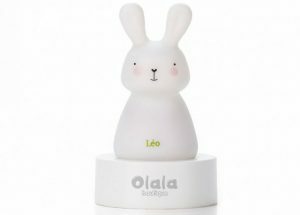 Designed for little hands, the rabbit lights up all night from anywhere in the room, even from within the crib! With a twelve hour battery life, it automatically lights up when it’s off of its charging base. Just set it on the base in the morning for another night of uninterrupted sleep! Best of all, a restful night only costs you $44. We love the way Around the Crib makes our babies look! Want to buy one of these cute options? Check out their website at aroundthecrib.ca or their social media pages like Facebook and Instagram.